Already a helluva show, this vivid, technicolor revival makes On The Town the sprightliest 71-year-old on the block. 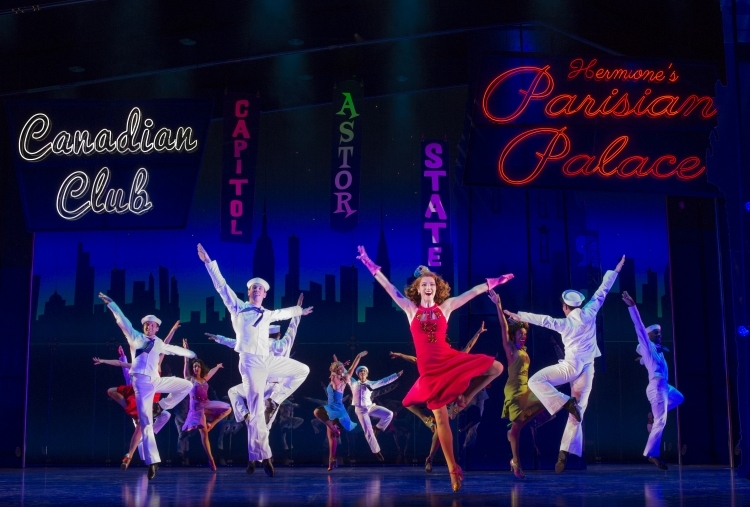 Harking from the very dawn of Broadway’s golden age, On The Town enjoys the blue chip pedigree of Leonard Bernstein’s rapturous, pulsing score and the delectable book and lyrics of Betty Comden and Adolph Green. 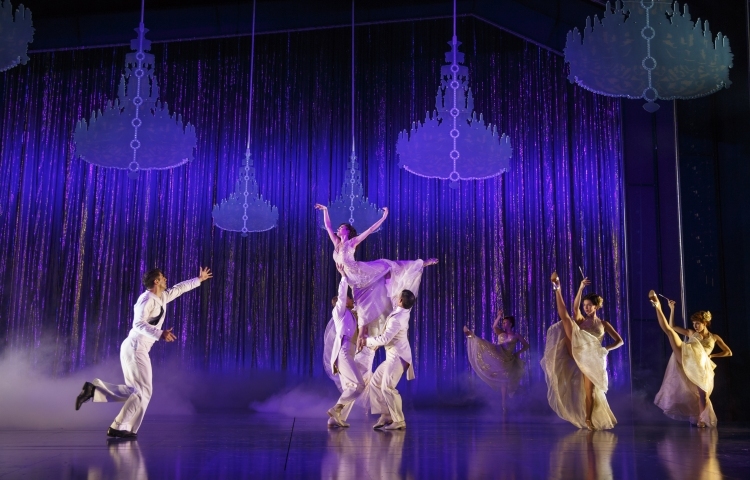 Created in the heyday of Broadway choreography from the likes of Jerome Robbins and Agnes de Mille, the most delightful rediscovery of the show is the extensive use of choreography as storytelling. Relative Broadway newcomer Joshua Bergasse captures Robbins’ original style, providing absolutely stunning choreography as he returns a distinctly balletic vocabulary to the Broadway stage. The featherlight triple boy meets girl concept of the plot allows the audience to just sit back and enjoy the show as three sailors spend a whirlwind 24 hours discovering the pleasures of New York City. Director John Rando keeps the energy sky high and the comedy broad. With a nod to the highly respectful treatment of the score in the South Pacific revival Bernstein’s music sounds wonderful as played a 28-piece orchestra, who are acknowledged and applauded in the same manner as an opera or ballet orchestra. Thankfully, the music has been preserved on a new two-disc cast recording. The patriotic production features the stars and stripes as its showcloth, and begins with the audience standing to join in singing US anthem “Star-Spangled Banner.” Beowulf Boritt’s bold design is awash with vibrant Superman tones of red, yellow and royal blue. Further wit and colour are found in Jess Goldstein’s delicious costumes. As well as a glossy tarkett on the floor, a rear full-size perspex screen provides extra reflection of the gorgeous dancing and costumes. Animated silhouette projections enhance the effect of the subway and wild taxi rides. Heading a cast of true triple threats, leading man Tony Yazbeck gives a performance for the ages as Gabey. Handsome and muscular, Yazbeck’s singing voice is as pure and charming as his dancing is effortlessly stunning. Best of all, he has an understated, modest style that belies his mammoth talent and makes his work all the more endearing. 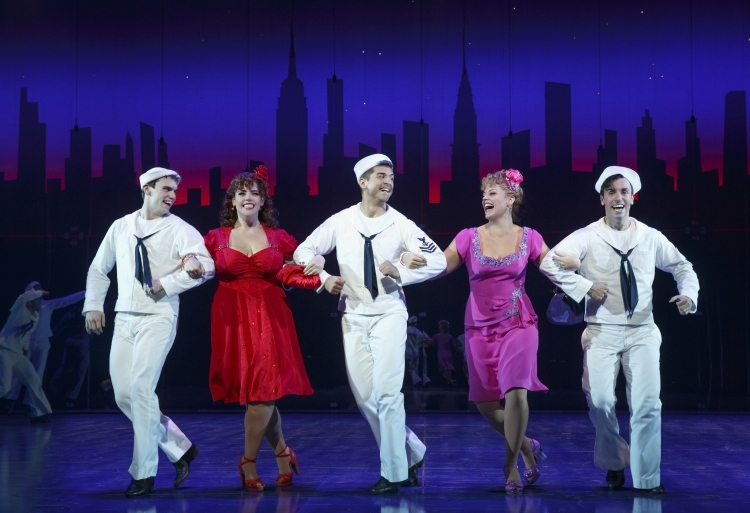 Jay Armstrong Johnson (Chip) and Clyde Alves (Ozzie) complete the trio of lively sailors, each singing and dancing in stellar style. As Ivy, aka Miss Turnstiles July, Megan Fairchild is a lovely partner for Yazbeck, delivering sweet singing and wonderfully balletic dancing. As spontaneous good tie girl Claire de Lune, Elizabeth Stanley has the infectious character presence of a young Sherie Renee Scott. Curvaceous stunner Alysha Umphress wins a generous share of audience affection as bawdy taxi driver Hildy. Sadly, inspired comedienne Jackie Hoffman is still sidelined with a foot injury. Allison Guinn, however, provides plenty of laughs standing in as Madame Dilly and the determined Little Old Lady. In a variety of supporting roles, Phillip Boykin determinedly channels 2015 Tony winner James Monroe Iglehart, even dressing like Aladdin’s Genie at one point. 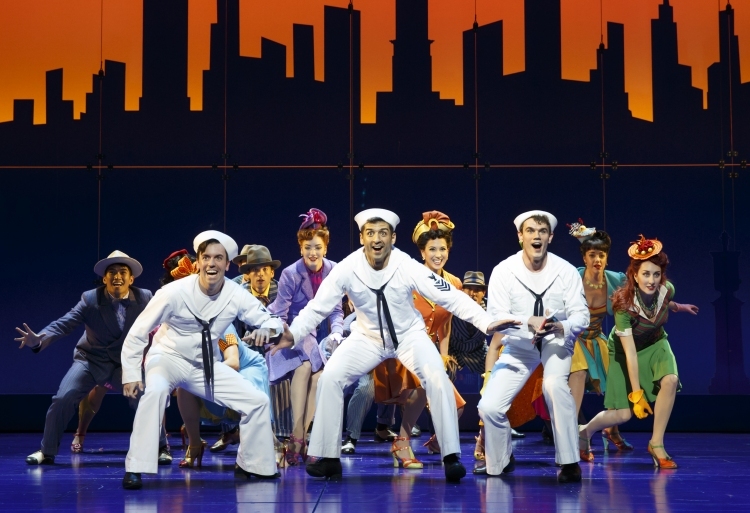 On The Town is as much a tourist attraction as any of the sights mentioned in its story. 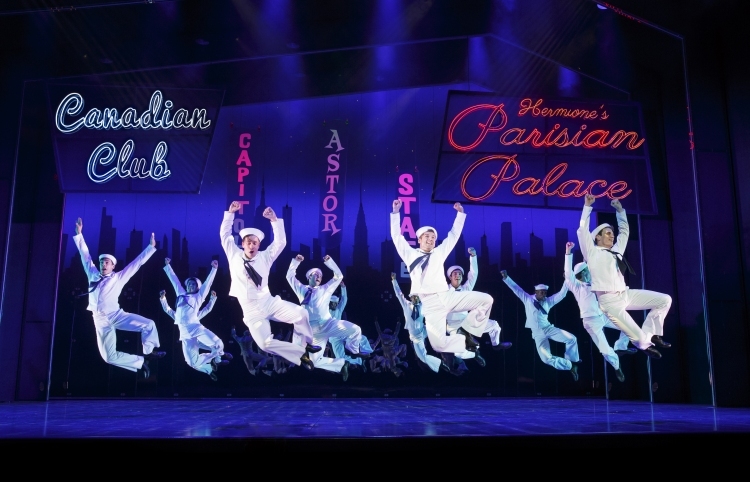 The classy music and choreography add significantly to the recommendation to catch this show.